Ever wondered how far a timber joist will span before it starts to deflect noticeably? More than likely not. But if you are designing houses, extensions or loft conversions, it’s important stuff. You can look the info up on a Span Table (here’s the NHBC’s version). So where do you find such a table? This information really ought to be in the public domain – i.e. available for free on some website – but it doesn’t appear to be. It’s not exactly a trade secret and I don’t think it has any valuable Intellectual Property Rights attached to it. But if you want to access the timber span tables, you have to pay. What’s bizarre is that the span tables used to be embedded in the building regs, which are now in the public domain thanks to the internet. Get hold of a copy of the old Part A for England & Wales and there they are, in Appendix A, a 28-page blockbuster which covered every conceivable timber span you could ever think of, from humble floor joists to rafters and purlins. But the new improved Part A, 2004 version, has seen fit to eliminate this useful information. Clause 2B1 states: Guidance on the sizing of certain members in floors and roofs is given in "Span tables for solid timber members in floors, ceilings and roofs (excluding trussed rafter roofs) for dwellings”, published by TRADA, available from Chiltern House, Stocking Lane, Hughenden Valley, High Wycombe, HP14 4ND, Bucks. Very nice for TRADA who charge £17.50 for their span table booklet. 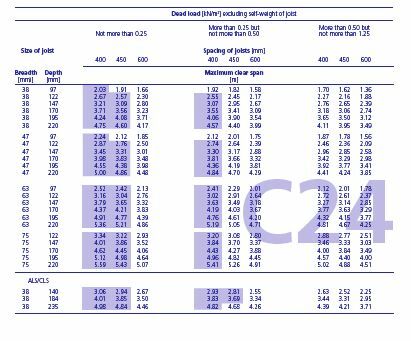 You can find simplified versions of the span tables in the NHBC Handbook, which is also available at a price of £35, but obviously includes far more information than just timber span tables. But it begs the question, why remove something useful from the public domain? What harm is it to have the span tables available for free? Have just checked the ODPM building regs website and the 1992 edition of Part A is still available for free download, complete with the Span Table Appendix. So hurry and get yours before they hit the delete button. If you can’t be arsed to wade through page after page of boring tables, here’s a really useful nugget you might care to remember. Halve the depth of the joist in inches and you get the span of the joist in metres. Thus a 9” joist will happily span 4.5m. And a 3.5m span will require at least 7” joists. Now you don’t even need a span table. Here’s a neat product I learned about last weekend at the HomeBuilding & Renovating show in Somerset. Saniflo are not a new name in the building industry; they produce waste pumps that enable you to fit loos in basements so that the waste can be taken up to a drain. If you want to pump poo, Saniflo is the way to go. Naturally, Saniflo would like to sell us more than poo pumpers and their catalogue shows all manner of useful applications. However only one really caught my eye and that was a small pump which they call SaniCondens. It gets around a noted problem with the installation of condensing boilers. These energy efficient boilers, which are now becoming mandatory under our new building regs, produce small amounts of slightly acidic liquid which you have to dispose of. If you fit the boiler near a drain, you don’t have a problem. But not all boiler positions are handy for drains. Part L, the reg that deals with this, allows you dispensation to fit a non-condensing boiler if you haven’t got a drain point. But SaniCondens will get around this problem as it can lift the waste up to 4.5m, which should be enough to get to a drain off point. They retail at £88 plus VAT. Jeff Howell, the Sunday Telegraph’s resident builder, writes this week on the vexed subject of cavity wall insulation. Jeff is firmly in the non-believer camp: he reckons that cavities, if built empty, should be left empty because the original intention behind a cavity was to stop water penetrating from the external brick cladding through to the house. Well, that is what the cavity wall designers would have us believe. But my researches tell me that the reason for the widespread adoption of the cavity wall design in the 1920s and 30s was nothing to do with builders wanting to improve construction standards. No, it was down to cost and speed. It was (and remains) much quicker and cheaper to build a single skin of brickwork separated by a cavity from a single skin of blockwork, than to build a double thickness brick-only wall, the way Victorians and Edwardians built brick houses. In today’s money, it costs around £50 per m2 to build a single skin of brickwork, about £20 per m2 to build a block wall, thus around £70 per m2 to combine the two around a cavity. In comparison, a solid double-skin brick wall is going to cost close to double a single skin one, i.e. £100 per m2. It’s a no-brainer. If you were a 1930s housebuilder, you would switch to cavity walls, and tell your customers you were doing it for their benefit. What’s remarkable about the whole cavity wall story is just how useless the cavity has been. It’s only marginally better at keeping rain out of a house than solid brickwork. It seems to make little difference whether it gets filled with insulation or not. Wider cavities perform better than narrower ones and failure rates are highest where the rain falls the most: neither of these facts will startle you. The question, which exercises Jeff so much, is whether you should or shouldn’t inject insulation into an empty cavity. The government is all in favour as it’s one simple and cost effective way of reducing carbon emissions. And there are tempting grants available for you to do this. Check out the Energy Savings Trust website . Jeff reckons it causes problems elsewhere, specifically making damp penetration problems more likely. His evidence is sketchy at best: he claims that he gets a bulging postbag when he writes on the subject from people who have suffered penetrating damp and condensation problems since having their cavities injected. Jeff has a more specific beef than just compromising the cavity. He reckons that cavity wall installers’ favourite material is mineral wool because it’s cheap and it’s very quick to blow in. In fact, he writes that gangs can do five houses a day. And he also claims that the job is often rather poorly carried out. At five houses a day, I can quite believe that. This leads to a problem with voids, where they have missed bits of the cavity out, and slumping, where the mineral wool fails to hold its position. Both these will lead to cold spots. In fact work by Kingspan, the Irish insulation manufacturer, supports these claims. They have undertaken various thermographic studies that highlight the prevalence of cold spots inside cavities. Now Jeff reckons that these cold spots are likely to cause condensation inside the house. I think he’s wrong. He writes because the house is now better insulated, the internal temperature can rise and with it, relative humidity. This means wall areas that are slightly cooler than the rest can be subject to condensation and black mould, which can give the impression of penetrating dampness. I'm not convinced this is correct. Condensation requires temperatures to fall below a dew point: in most modern homes, that dew point is around 12°C. It varies with the relative humidity levels but in most homes in winter the internal temperature is kept at around 20°C and the relative humidity sits at between 50% and 60%. This air: moisture mix hits its dew point at 12°C. Now increasing the temperature doesn’t of itself increase relative humidity: in fact, without adding more moisture, it does the reverse. It certainly doesn’t affect the dew point temperature. If you leave a room unheated and the temperature falls below 12°C, you will find condensation forming on the coldest surface, which is often the window. If there is a cold spot in the wall, maybe where the cavity wall installers have missed a bit, then, yes, there is every chance that condensation will form next to it. But it is not the cavity wall insulation that is causing the problem, it’s the low internal temperature. 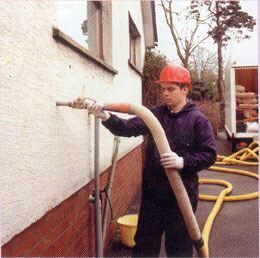 In fact, cavity wall insulation should improve the situation because the room temperature will stay higher for longer, because the heat loss characteristics of the room have been improved. So what’s my advice regarding cavity wall insulation? I say, go for it. If the installers reckon it’s OK, then I really can’t see what the problem is. And if it’s not installed perfectly, it is still better than nothing. But I do agree with Jeff on one thing. I think mineral wool is the worst option for this work: I’d go for polystyrene beads, everytime. What’s remarkable about the resting of control of virtually an entire strata of British industry is a) how quickly it’s happened and b) how little attention has been paid to it. To be fair, all of the foreign owners continue to operate out of the UK so in some ways the change of ownership doesn’t have a huge impact on the local scene. But can you imagine the fuss if a collection of French, Germans, Mexicans, Americans and Japanese were to buy up 95% of our farmland? In some ways I am in awe of just how relaxed our nation has become about these matters. Or maybe we are just the world’s tart: you can have anything you want, Dearie, if you pay the right price. But the subject of this particular blog isn’t the UK Building Materials Sector. No, that’s just occupied the first 265 words of this discourse. The subject is its cousin, the UK Housebuilding Sector. Partly because it makes an interesting contrast with the Building Materials Sector and partly because it too is subject to a takeover bid or two. The first thing to note in this compare and contrast exercise is that there are no foreign owners in the housebuilding sector. None. There was one, the American Centex Corporation, which purchased the medium-sized Fairclough Homes and ran it for several years. But this year, Centex has off-loaded Fairclough to the privately owned Miller Group. They are Scottish, but that doesn’t actually rank as foreign. What the sector consists of, from the stock market’s angle, is around 15 quoted housebuilders. There are another dozen privately owned ones, which operate at a slightly smaller scale to the quoted ones. This combined grouping builds around 70% of all the new houses in Britain. Over the past six or seven years, there has been a lot of merging and taking-over in this sector but it’s all been carried out by the local hoodlums. No out-of-towners. Why should housebuilding remain such a local activity? The UK housebuilding scene is unique. Nowhere else do so few companies control so much of the market. Only the USA has anything remotely resembling the UK housebuilding scene — i.e. giant housebuilding companies — and, over there, it’s fragmented and regionalised. Elsewhere, housebuilding businesses are involved in certain large schemes, like urban regeneration, but they don’t do mass-produced housing for sale across their countries. Not the way we do. So I guess this explains the first part of the conundrum: there simply aren’t any equivalent businesses lurking around elsewhere that could sensibly gobble up a UK housebuilder or two. As I say, only in the USA is the scene remotely similar and the cross-border activity – both ways – is virtually restricted to UK-USA business. So whilst St Gobain or Nippon Glass feel entirely comfortable digesting a similar business to theirs based in Britain, they would feel distinctly queasy about buying a large housebuilding business because they have no frame of reference with which to judge it, let alone the skills required to manage it. Therefore UK housebuilders have a protective shield wrapped around them by virtue of their uniqueness. But there is more to it than uniqueness. There is also a weird and wondrous understanding between national housebuilders and the UK government, based around the use and abuse of the planning system. The problem here, at least as far as outside businesses are concerned, is that the UK housebuilding industry works hand-in-glove with government regarding allocation of land and that this relationship means that there isn’t really a free market here to be exploited. If you like, it’s a boys’ club and entry to it is more or less determined by who you know, and success is determined by how well you play your hand of cards, not by any innovative strategies or unique selling points. It’s a very difficult market in which to gain any competitive advantage and consequently it’s hard for consumers to know or identify with any individual companies. Brand loyalty is virtually non-existent. A foreign buyer would immediately risk loosing the all-important contacts that make these businesses tick-over and would find it very difficult to add value in any way. Now historically, the less a housebuilder has actually got involved in the building process, the better they have done out of it. What they have been good at is doing land deals: everything on downstream from that has just been a hassle to turn the deals into cash, three or five years down the line. None of them has been particularly interested in the process by which they deliver homes to their customers and consequently design flair has been largely absent and construction standards have been, shall we say, unchallenging. You’d have thought that with a captive market and little meaningful competition, the way would be open for young-Turk housebuilders to appear on the scene and blow the opposition away. Five years ago, three quoted housebuilders broke ranks with the status quo and decided that they would like to try something different. They began to experiment with actually making houses themselves in factories rather than just subbing out the whole process to the boys on site, in the time honoured way. We are really only talking about switching to in-house timber frame here, not exactly cutting-edge technology, but for a housebuilder to actually build houses was something novel. The first on the block was a housebuilder called Beazer. They’d had a small timber frame operation in Scotland since 1993 and they decided they would start a larger one up in England to service a big chunk of their output. However, no sooner had they bought and tooled up their plant in Ipswich than they were taken over by Persimmon, run by the ex-rugby player and brick-and-block lover John White. End of experiment. The second one up was Wilson Connolly or Wilcon, as they preferred to be known. Wilcon had big ideas, not just for off-site construction but for an entirely vertically integrated supply route with materials arriving pre-packaged in containers for quick on-site assembly. They spent £3million on a software package to run all this and set up a subsidiary called buildpack.com with the express intention of bypassing the merchants. Their plan was to have 90% of output built off-site by 2004. Results? Disaster. Teething troubles meant that quality control actually went down and margins took a hit. In 2001, a boom year for housebuilders, Wilcon were the only one to report a decline in profits. The board acted: the group MD John Tutte and Mr Innovation, John Weir, were ousted and an old hand took over, pledging to get back to the traditional methods of working. But it was too late for Wilcon. They were taken over by Taywood in 2003. And the third? Westbury took a more cautious approach but still ended up building the biggest timber frame plant in Europe, Space4 at Castle Bromwich, just off the M6. They never planned to build more than a “large proportion” of Westbury homes at Space4 and in many ways their intentions were the least ambitious of the three. Nevertheless, Westbury’s margins began to suffer in comparison with the competition and this week, Westbury has become a bid target from none other Persimmon (again). If Persimmon wins Westbury, they will become the largest housebuilder in the UK and the fate of off-site construction in the private housebuilding arena will be effectively sealed for another generation because it seems unlikely that Persimmon will persist with the Space4 concept. There is an old adage in housebuilding circles that less is more. The less you get involved in the building process, the more money you make. The conservatives in this business — and there are many — are secretly delighted that these builders with ideas have all been vanquished. It means that they can go back to the life they knew, of doing deals with landowners and planners, well away from the public gaze, and that they won’t really have to think too hard or get their hands dirty. It also effectively inoculates the entire industry against foreign competition because it’s returned to the gentlemens' club ethic where it’s hard to bring about significant changes, let alone improvements. It also partly explains just why the UK housebuilding scene is so technologically backward in comparison with other similar cultures. Off-site construction has been shown to work well: the Scandinavians are masters at it, the Germans increasingly good and the Japanese, as you might expect, have taken it to a new level. It’s even widely used in Britain in the commercial sector. But there is this huge inertia just to leave things as they are in private housebuilding. For the reality is that the money is made on the land deals and the planning gains and that, whilst off-site construction can deliver houses quicker, it doesn’t actually make them any cheaper and UK housebuilders don’t really want quicker homes. They just want a steady drip feed of new houses coming onto the market so that they can sell them at premium prices to buyers who have little choice available to them. As they say, less is more. This morning, it’s the World Wildlife Fund that is having a pop at Tony Blair: WWF are an active environmental lobbying group. It’s always struck me as a little strange that they should be so active in this arena but what the heck. But what can Tony Blair, or for that matter any other democratic politician, actually do? Very little. They can encourage and cajole, they can subsidise various renewable energy and energy saving initiatives, but what they really need to do is to make us all wear a hair shirt. Like a swingeing tax on air fuel, big petrol-pump size carbon taxes on domestic fuel supplies, masses of road charges. But this stuff is way off the democratic agenda: if any politician tried to force these measures through, they’d be out on their ear. What the climate change lobby desperately needs is a disaster, and one that can be unequivocally linked to global warming. This year we’ve had a tsunami and a huge earthquake, neither of which has anything to do with climate change. We’ve had a few nasty hurricanes coming out of the Caribbean, which may have been caused by the oceans getting warmer. But then again, they may not: no one can be sure. Melting glaciers? Tough on the skiers but really who cares! There has been nothing to knock us out of our complacency. We like life the way it is, we don’t want to give up our cars, our central heating, our holidays in the sun and our supermarkets stuffed full of exotica from all around the world. For us to start thinking like that would take a major event of gob-smackingly awful proportions. And for us to be 100% sure that it was climate change that was responsible. Rising sea levels: where are you? Come and inundate Holland or submerge the Seychelles. Gulf Stream to vanish and give the UK continental winters? Come on then, wreak your worst. Until such events occur, we will be left arguing about the textual changes in the next set of building regs. Should air tightness testing be compulsory, or can there be some sort of trade-off? And should the new U value for walls be 0.3 or 0.27? And how exactly should these U values be calculated? Do we really think this is going to stop global warming? I don’t think so. Whilst it’s easy to make fun of the Emperor Nero fiddling whilst Rome burnt, the fact that his fire brigade couldn’t be arsed to get out of bed did rather limit his options. WWF aiming blows at Blair is going for the soft target: they need to get real and point out who the real culprits are. You and me. Or maybe they should just be patient and wait for the coming cataclysm. Bill Dunster is, for want of a better word, an ecotect. That is an architect with a passion for green design. He sprang to fame with a project known as BedZed, a development of live-work units built on a disused sewage farm in Beddington, South London. It’s had acres of publicity and is rightly held up as an exemplar of how multiple housing units should be built in the future. But BedZed has now been finished for three years and Dunster has found it a hard act to follow. Developers and social housing landlords have not been falling over each other to repeat “the experiment” and he has been frustrated by planners who haven’t been prepared to loosen the planning corset just because a scheme is green. But at last, Dunster has another scheme to showcase his talent. This time it’s a four-storey block of key worker flats on the St Matthews council estate in Lambeth, South London. It’s not quite as big or prestigious as BedZed but in some ways it’s more technically advanced. Building carried a feature on it this week, which caught my eye: in particular, the wall detailing. The outer walls are no less than 550mm wide, compared with just under 300mm in conventional housing. They are made up of 150mm blockwork inside 300mm of expanded polystyrene insulation filling the cavity, behind a 100mm brick skin, which is what them outside world sees. The plus point is of course that, with this much insulation, you have got a tremendously low U value – reckoned to be just 0.1W/K/m2. But against this, on a 60m2 apartment, you are loosing up to 25% of the footprint to walling. Yikes. That’s a hell of a lot, especially considering we are being encouraged to build smaller and smaller units. Dunster is a big fan of heavy mass construction, which means little or no timber frame and little or no off-site pre-fabrication. He believes in the importance of thermal mass (concrete in other words) in regulating the temperature characteristics of a home and in reducing the effects of summer over-heating. But is thermal mass really such a wonderful concept that you have to loose 20% or more of your floor area just to accommodate it? If there wasn’t quite so much south-facing glazing — another of his betes verts — then perhaps the designs wouldn’t require quite so much thermal mass and the walls wouldn't have to be quite so thick. 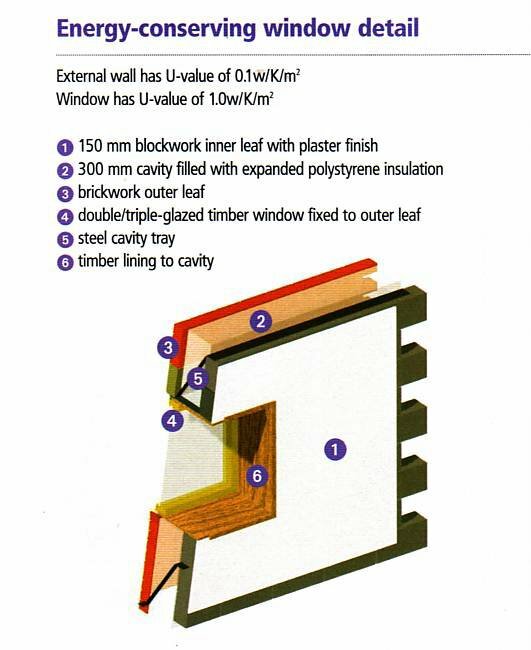 Another problem comes with the adoption of a 300mm cavity, shown here in diagramatic form, (ref Building magazine). How do you manage the openings? In particular, how do you ensure that the water penetrating the outer brickwork is directed back out of the external wall rather than dripping down into the joinery? You’ve left the world of conventional construction far behind here: there are no off-the-peg wall ties this long and there are no pre-formed cavity trays this wide. 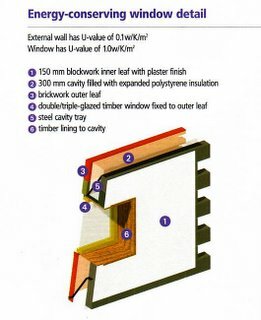 Dunster’s solution has been to design a wrap-around cavity tray around each window. To me, it sounds just like the sort of detail which is likely to fall victim to sloppiness on site. Done perfectly, there should never be any problem but construction isn’t a perfect world. One other feature of this article stands out. The costings. £1600/m2. This isn’t, in fact, far out of line with many other innovative social housing projects being built around the country at the moment, but it’s about twice the rate that selfbuilders hope to complete their projects for. Why the huge discrepancy? A good question, which will have to wait for another blog. Now, if the job is so unsatisfactory that it goes legal, an apportionment of blame will take place. The client is frequently surprised and appalled to learn that the learned counsel does not treat them as innocent bystanders being chewed up in a shark pool, but willing players in this game of roulette. And frequently, the blame for jobs going over budget is largely placed at the door of the client, for many of the above reasons. If there is an architect involved, the decisions get even more complicated because there are now three parties to the disaster and they all have a hand in what goes wrong and, usually, the blame is interdependent.